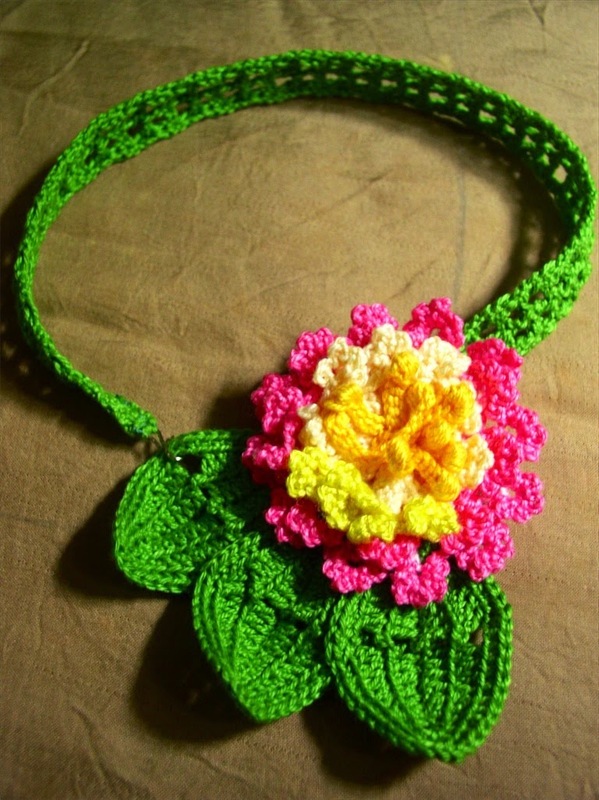 Make the Lantana Flower as corsage or attach to a crocheted strap to make a necklace or hair ornament. 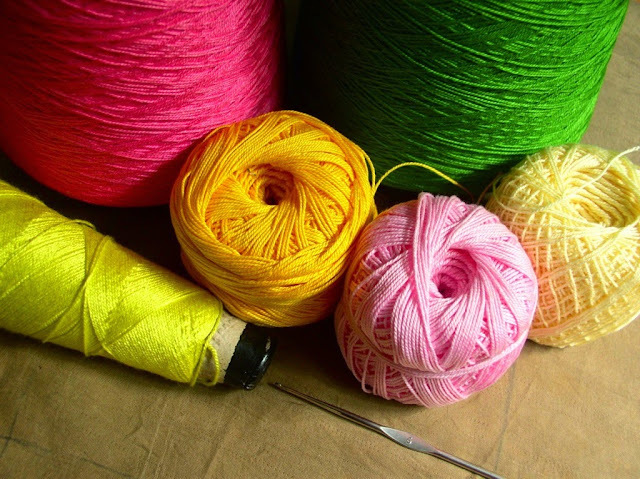 You will need: Crochet cotton thread size 8 or 10: bright pink, green, yellow, yellow-orange, pale pink, pale yellow. Center buds: With yellow-orange thread, *ch 7. 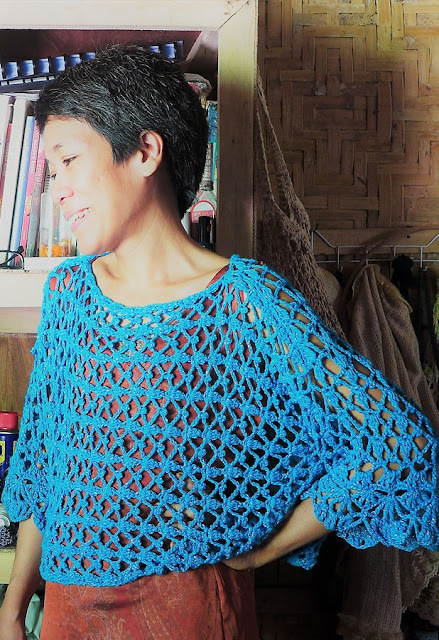 Holding the ch taut with the thumb and middle finger of the left hand, thread over hook, point the hook towards you and swing it under the chain, catch the thread from under the chain and pull it up – there should now be three loops over the hook (one “over” completed). Make a total of 5 overs. YO and pull thread through all 11 loops on hook, ch 1 to tighten the loops into a knot, sl st in ch at base of knot (Clones Knot completed). Sl St down the ch. Rep from * to make 10 buds. Sl st in ch of first bud stem to make a ring, fasten off. It can be tricky pulling the thread through all the loops on the hook. I have found that it is easier to do this if I push the overs near the shank of the hook as I make them. This will make the loops of the overs a bit bigger and more even so passing the hook and thread through them will be easier. So don’t work the overs too close to the tip of the hook. Also, when you are about to pull the thread through all the loops, relax your grip on the loops/overs, just let the tip of the hook do all the work of catching the thread and passing it through all the loops. I have found that there’s less chance of the hook getting caught in the overs if you release your grip on them. Middle ring: With pale yellow thread, *ch 7. Sc in 2nd ch from hook and in each ch (first stem made); rep from * to make 10 stems. Sl st in ch of first stem to make a ring, fasten off. With yellow thread, attach with sc to tip of first stem. *[Ch 3, sl st in sc (picot made)] 5 times, ch 3, sc in tip of second stem, rep from * on 4 stems. Fasten off and continue putting picots on the remaining 6 stems this time with pale yellow thread. Outer ring 1: With pale pink thread, make 10 stems as in middle ring. Fasten off. Make picots as in middle ring using bright pink thread. Fasten off. Outer ring 2: With pale pink thread, make 12 stems as in middle ring. Fasten off. Assembly: With floss thread or matching color thread, sew center buds, middle ring and two outer rings together. With green thread, ch 18. Rnd 1: Sc in 2nd ch from hook, sc in next ch, hdc in next 2 ch, dc in next 3 ch, ch 2, sk 2 ch, dc in next 4 ch, hdc in next 2 ch, sc in next ch, 4 sc in last ch, sc in next ch on other side of leaf, hdc in next 2 ch, dc in next 4 ch, ch 2, sk 2 ch, dc in next 3 ch, hdc in next 2 ch, sc in next 2 ch, 3 sc in tip of leaf to turn to other side. Rnd 2: Sc in next 2 sc, hdc in next 2 hdc, dc in next 3 dc, ch 3, sk 2 ch, dc in next 4 dc, hdc in next 2 hdc, sc in next 2 sc, 2 sc in each of next 2 sc to turn to other side of leaf, sc in next 2 sc, hdc in next 2 hdc, dc in next 4 dc, ch 3, sk 2 ch, dc in next 3 dc, hdc in next 2 hdc, sc in next 2 sc, 2 sc in sc at tip of leaf. Rnd 3: Working in back loops only, sc in each st all around leaf with 2 sc in st at tips of leaf to turn. Fasten off. 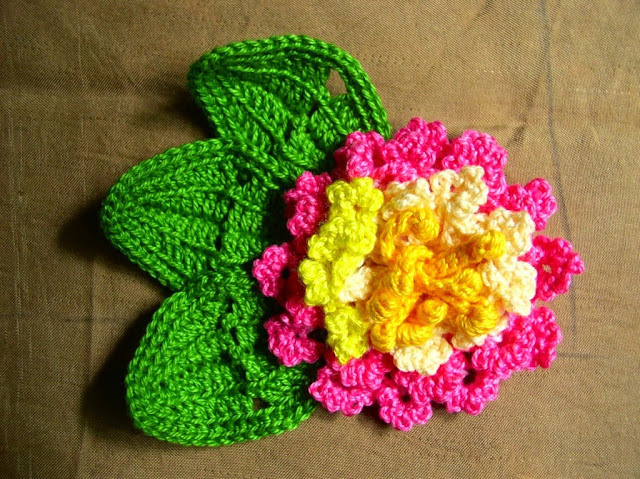 Assembly and finishing: Using photos as guide, put the three leaves together side by side in fan-like arrangement and sew together. Sew leaves to flower cluster. Weave in all ends.